See in our review that Max Your Profit of James Forley is another old scam that has made a comeback. Max Your Profit is presented as an automated trading system that can earn you hundreds of dollars per day in trading financial markets. Forley says that you can get his system for free, but is it true? The truth is that Max Your Profit is a three years old scam that has been recycled. It started in 2016 as Profit Maximizer. In our linked review you will be able to see that it is the same program, only the name is different. In the Max Your Profit video you will see Forley showing his alleged trading results and profits, but everything is fake. In fact, Forley is a fictitious person with fictitious results. The same applies to results of the users of this system that are shown on the website. You can see on our picture that they are randomly generated, because sometimes you will see a different name with the same photo. 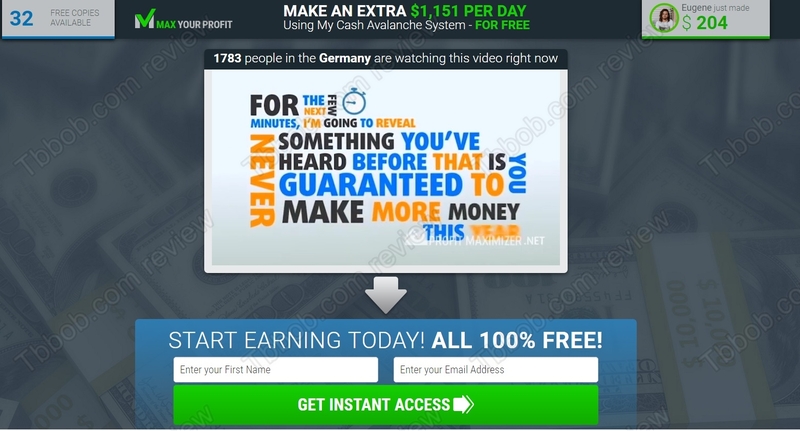 Max Your Profit is based on a software that has been used by several scams. We have a lot of feedback about it, so we know that it is losing money. People have been complaining about it a lot. The software has no real trading strategy, it is just made to pick up random trades that will lose your money. Forley keeps saying that he does not want your money and that Max Your Profit is free. But it is not true. When you register, you will immediately be required to deposit at least $250 with an unregulated broker of his choice. People who run this scam are paid by some unregulated brokers for sending them new victims. Once you make a deposit with them, the money will be gone forever. Max Your Profit is a recycled scam that has lost a lot of money to a lot of people, don’t fall for it! If you want to experience financial trading, start safe on a demo account with a regulated broker. Use the demo to learn how to trade and to understand the risks associated with trading with real money.